Written by Samuel Gomes on September 19, 2018 Blog, Marketing. Create your coupon. If you need a little help, here’s a step-by-step guide. Install the official MailChimp for WooCommerce extension. Following the prompts to configure it. Install the Insert Headers and Footers plugin. We’ll come back to this later! Click Create at the top right corner, then click Signup form — it’s at the bottom of the list. Click Pop-up form, select a mailing list from the drop-down menu, then click Begin. If you haven’t created a list yet, here is some guidance around that. Customize your pop-up. The MailChimp pop-up creation tool offers a lot of style and functionality options, so play around. For more detail, take a look at MailChimp’s in-depth explanation on pop-ups. When you’re happy with your your pop-up, click Generate Code. Now, head back to your WordPress admin page. Remember the Insert Headers and Footer plugin you installed? You’ll find it in Settings → Insert Headers and Footers. 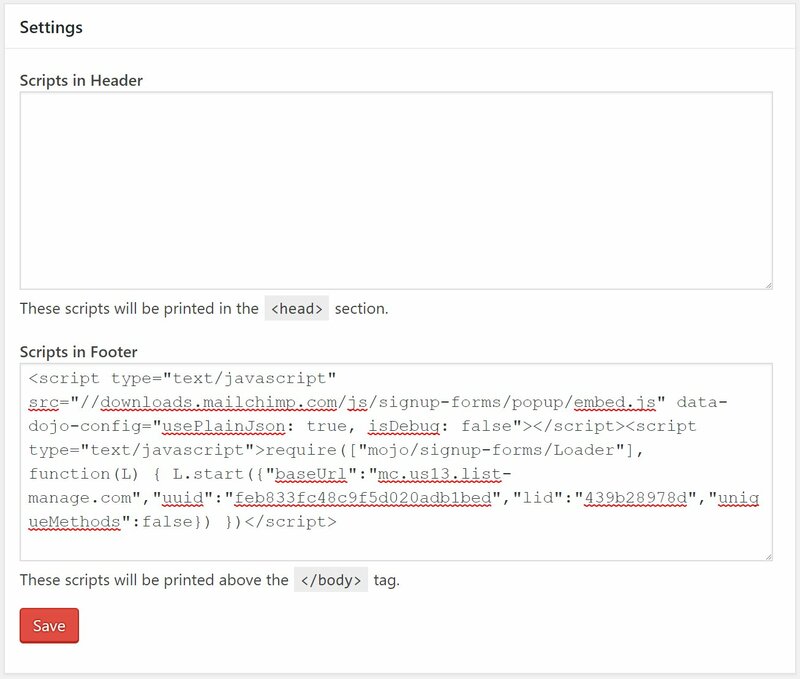 Paste the code in the Scripts in Footer box, then click Save. Your store should be displaying the pop-up as configured! The next step is to give your customers the coupon your promised them. You have two options in MailChimp for passing the coupon on to your customers. The simpler option is to display the coupon code in the success message, right after your customer subscribes via pop-up. You can do this by editing the Sign up success message under Content tab. up, without leaving your store. In the second approach, you’ll set up an automated email that’s sent every time someone subscribes using the pop-up form. Click Create, then Email. Select the Automated tab, then Subscriber Activity. Select Thank pop-up form subscribers option. Give the campaign a name and link it to a list. Your new email workflow now exists, but needs a little configuration. Click Design Email and fill the Email information section. You’ll be presented with lots of layouts and themes. Choose a theme and tweak it, or select a blank layout and build your email from scratch. After saving your email design (don’t forget to mention the coupon code! ), you’ll return to the workflow page. Click Next on the bottom right corner to proceed to the last step, then Start Workflow. Well done! Now everyone who subscribes to your pop-up form will receive the configured email. Whichever approach you choose, you will have an effective way to start building your email list and can entice them back to your store over and over again. Automated campaigns help you make this possible. To take your email marketing even further, I recommend Kazia Galazka’s great post on getting the most out of MailChimp. Abandoned carts are a big concern for eCommerce stores. The Baymard Institute says the average cart abandoned rate is 69%. That means 7 out 10 customers are interested in your products, search for them, add them to their carts, then leave without buying. Fear not. You can recover 60% of them using abandoned cart recovery emails. MailChimp offers an automated workflow for that, or you can try a specialized service like Jilt. We hope these tips will help you grow your customers’ loyalty. Finally: Get deeper into MailChimp. They have a lot to offer, especially if you’re running a small business. Was this post helpful to you? Let us know your marketing and couponing experiences in the comments below. this is great tool but can you say that it work on amp version of website? Hey Harshil Patel. the procedures may be different. This is a great article I must say. It has all the information with much clarity. I was thinking about email list building for the DBPMagazine. I’m a Graphic designer and aspiring artist as well as Design Editor here. So I thought about the events e-mail campaign for the autumn meetings. I’ve been using the MailChimp for the design campaigns, but never customized pop ups. Thanks for the tips. I love MailChimp and thanks for telling me about this features. Both WooCommerce and MailChimp is a best combination. Thanks for the information published. Good method to grab customers. I love your tips and it is definitely provide me more sales. One of the best ways to communicate with customers and inform them is to have an email audience that has proven to be an experience for me. These are really awesome ideas. We need to take of laws as well in the process..
Great tips! Thank you for sharing the step by step guide! Hey thanks for sharing this content. https://mcgarrypartners.com.au/ these guys can assist regarding tax and accounting if you need to know. They are based in Brisbane.